The 51st National Science Olympiad awards to celebrate excellence in science teaching and learning took place at Emperors Palace on 02 July 2015. The annual event recognises Southern Africa’s top young science achievers and schools in the disciplines of physical and life sciences. The Minister of Science and Technology, Naledi Pandor, congratulated the winners and sensitized them on the magnitude of the responsibility that they had towards South Africa, Africa and the world as a whole. The world needed new solutions that would foster sustainable development and result in food and energy security among other things. “We need you to provide these sustainable solutions that will ensure that we save the earth and its resources for future generations,” Ms Pandor told the budding young scientists in her keynote address at the awards ceremony. “South Africa and the whole of Africa are confronted with the urgent challenge of developing our science and technology capabilities so that we are able to respond to the development challenges of the continent. The Olympiad aims to contribute towards excellence in science among learners and to encourage them to take up careers in science, engineering and technology. Just under 30 000 learners in grades 10 to 12 wrote either the Physical Sciences or Life Science paper on 3 March this year. Winners in different categories were awarded prizes such as laptops, iPads and cash vouchers at the awards event. 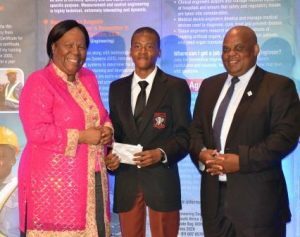 The top-performing schools received cash of up to R5 000. In addition, the top four learners in grade 12 will attend the London International Youth Science Forum in July 2016. The learners going to London are JJ Wilkinson (Bishops High School, Western Cape) who achieved the best marks in physical science and U Wagner (Crawford College, Pretoria) who outperformed all in life science. Joining them will be FH Hajee (Star College, Durban) after winning the top girl learner in physical science and LT Rammutla (Erasmus Monareng High, Vosloorus) who achieved the best marks in physical science for a learner at a previously disadvantage school. One top achiever in grade 10 and another in grade 11 will attend the Science Focus Week in Australia in January 2016. The two learners are J Yu (Crawford College, Pretoria) for achieving the best marks in physical science among the grade 10s and RA Purcell (St Mary’s DSG Kloof, KwaZulu-Natal) who beat her grade 11 counterparts in the life science category. Another top winner in the 2015 National Science Olympiad awards was HY Mathivha from Mbilwi Secondary School in Limpopo. The recognition emanates from him being from previously disadvantaged school but having achieved top performance in the Olympiad for three consecutive years. He walked away with Special Award comprising a voucher worth R40 000. The condition of the prize is that it goes to registration and tuition fees at a university of this choice. The 100 learners who performed best in Olympiad examination were invited to attend the Science Focus Week in Pretoria in the wee starting on June 29. During their time in Pretoria the learners were exposed to role models and undertook industry visits for an introduction to the real world of work and career options. The sites visited include Cullinan Diamond Mines, South African Bureau of Standards, Nissan SA, University of the Witwatersrand, Observatory (in Pretoria) and the South African Nuclear Energy Corporation. The others were the National Zoological Gardens (in Pretoria), Botanical Gardens (in Pretoria), Denel Dynamics and Sci-Enza Science Centre.